Vixen GPD2 mount w/HAL130 tripod and motor set. Photo courtesy of Vixen Optical. There seems to be very little comparative information online about telescope mounts, although there are many sources of information, so we decided to compile our own list. We could not track-down and include every existing mount, but we have been able to accumulate a reasonable selection from Astro-Physics, Astro-Tech, Celestron, DiscMounts, iOptron, Losmandy, Meade, Mathis Instruments, OptiCraft, Orion, Paramount, Synta/PacificTelescope/Sky-Watcher, Stellarvue, Takahachi, Tele Vue and Vixen. This list includes alt-azimuth and German Equatorial type mounts, which are the most popular types in use by amateur astronomers. It does not include fork mounts, which are normally designed for specific catadioptric telescopes or Dobsonian mounts, which usually either come with telescopes or are homemade. Our thinking is that a person who has a telescope and needs a mount or wants to upgrade to a sturdier mount will find this list handy. 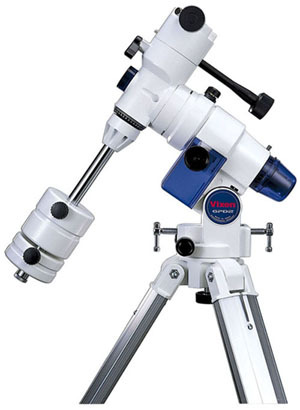 It should also be useful for the person who owns one of these mounts and wants to acquire a suitable size telescope. We found it interesting that the mounts sort of cluster in groups based on load capacity, so that is the way we have listed them. We have tried to strike a balance between too many groups and groups that combine mounts that are too dissimilar in capability. Thus, we combined the 20 and 25 pound capacity mounts in one group, but created a separate category for the 30-35 pound capacity mounts. In most cases we have used the manufacturer's recommendation for mount capacity (the maximum weight of the telescope and accessories it is intended to support), so there is bound to be some variation in actual capacity. Some folks are simply more optimistic than others and the shape and length of a telescope, as well as its weight, change the stress on the mounting system. In cases where mount capacity is not specified by the manufacturer, we checked the weight of the biggest telescopes offered on the mount in question and approximated mount capacity that way. As a practical matter, it is wise not to load any telescope mount to its rated maximum. For example, a mount rated for a maximum load of 20 pounds will probably be "rock solid" when used with a telescope weighing 10-12 pounds, and that is as it should be. If your telescope with its mounting rings and rail, finder, star diagonal, eyepiece and all accessories scales 17 pounds, we'd suggest a mount in the 30-35 pound class. Some mount heads come with supporting tripods or piers and some do not. Companies that sell separate mount heads usually offer something appropriate to attach them to as an extra cost option. If you have questions about suitable tripods and piers, consult the manufacturer. In the lists that follow, by "manual," we mean the mount is controlled and the telescope aimed by the operator, whether by means of turning slow motion controls by hand or pushing buttons on a hand controller to operate RA/Dec motors. By "go-to," we mean a mount controlled by some sort of computerized system that can aim the telescope at astronomical objects without direct human intervention. Celestron Heavy Duty Alt-Azimuth Tripod: manual, est. max. load approx. 7 pounds. iOptron SmartStar series (The Cube): go-to, max. load 7-11 pounds depending on tubes and attachments. Orion TeleTrack: go-to, max. load 9 pounds. Stellarvue M1: manual, max. load approx. 9 pounds. Sky-Watcher (Synta) AZ Synscan: go-to, est. max. load approx. 8 pounds. Sky-Watcher (Synta) AZ3: manual, max. load approx. 9 pounds. Sky-Watcher (Synta) HDAZ: manual, est. max. load approx. 9 pounds. Stellarvue M1V: manual, max. load approx. 9 pounds. Takahashi TG-SM: manual, est. max. load 4-6 pounds. Takahashi TLM7601: manual, est. max. load 7-9 pounds. Tele Vue Telepod: manual, est. max. load about 7 pounds. Tele Vue Panoramic: manual or manual w/encoders, est. max. load about 10 pounds. Vixen Mini-Porta: manual, max. load 10 pounds. iOptron Cube Pro: go-to, max. load 12 pounds. Orion VersaGo: manual, max. load approx. 12 pounds. Orion VersaGo HD: manual, max. load 15 pounds. Sky-Watcher (Synta) AZ4: manual, max. load approx. 15 pounds. Takahachi TG-LMLT: manual, est. max. load 15 pounds. Tele Vue Gibraltar HD4: manual or manual w/encoders, est. max. load about 13-15 pounds. Vixen Porta-II: manual, max. load 15 pounds. Vixen Skypod: go-to, max. load 15 pounds. Astro-Tech Voyager: manual, max. load 20 pounds. DiscMounts DM-4: manual w/encoders, max. load 18 pounds. iOptron MiniTower: go-to, dual-AZ - max. load 25 pounds plus 8 pounds. Orion SkyView AZ Mount: manual, dual-AZ - max. load one or two scopes weighing up to 25 pounds each. Stellarvue MG/MG2: manual, max. load approx. 20 pounds. Stellarvue MGE: manual w/encoders, max. load approx. 20 pounds. Stellarvue M2C: manual, max. load approx. 25 pounds. Tele Vue Gibraltar HD5: manual or manual w/encoders, est. max. load about 20 pounds. Vixen/StarGuy Alt Az Wood: manual, max. load approx. 20 pounds. Vixen/StarGuy Alt Az Pro: manual, max. load approx. 20 pounds. Vixen APZ Advanced Polaris: manual, max. load approx. 18 pounds. iOptron MiniTower Pro: go-to, dual-AZ - max. load two scopes 35 pounds plus 10 pounds. Losmandy AZ8: manual, dual-AZ - max. load 70 pounds (1 or 2 telescopes up to 35 pounds/side). Sky-Watcher (Synta) AZ-EQ5 SynScan: go-to, max. load 33 pounds. Skywatcher (Synta) AZ-EQ6 SynScan: go-to, max. load 40 pounds. Stellarvue M7: manual, dual-AZ - max. load one or two scopes up to 35 pounds. DiscMounts DM-6: manual w/encoders, max. load 40 pounds. Orion EQ-1: manual, max. load 7 pounds. Orion EQ-2: manual, max. load 9 pounds. Sky-Watcher (Synta) EQ1: manual, est. max. load approx. 7 pounds. Sky-Watcher (Synta) EQ2: manual, est. max. load approx. 9 pounds. Takahashi Teegul Sky Patrol III: manual, est. max. load 4-6 pounds. Orion AstroView: manual, max. load 12 pounds. Parks Astrolight EQ: manual, max. load approx. 12 pounds. Sky-Watcher (Synta) EQ3: manual, max. load approx. 12 pounds. Sky-Watcher (Synta) EQ3 SynScan: go-to, max. load approx. 12 pounds. Vixen Advanced Polaris: manual or go-to, max. load 13.2 pounds. Celestron CG-4: manual, max. load 20 pounds. Orion SkyView Pro: manual or go-to, max. load 20 pounds. Sky-Watcher (Synta) EQ5: manual, max. load 20 pounds. Sky-Watcher (Synta) EQ5 SynScan: go-to, max. load 20 pounds. Stellarvue (GSO) M4: manual, discontinued, est. max. load approx. 20 pounds. Takahashi EM-11: manual or go-to, max. load 25 pounds. Vixen/Celestron Super Polaris: manual, discontinued, replaced by GP2. Vixen Great Polaris: manual, discontinued, replaced by GP2. Vixen GP2: manual or go-to, max. load 22 pounds. Vixen Sphinx SX2: manual or go-to, max. load 27 pounds. Celestron CG-5: go-to, max. load 30 pounds. Celestron Advanced VX: go-to, max. load 30 pounds. iOptron SmartStar-PR (EQ-5): go-to, max. load 35 pounds. Meade LXD 75: go-to, max. load 30 pounds. Losmandy GM8: manual or go-to, max. load 30-40 pounds. Orion Sirius: go-to, max. load 30 pounds. Sky-Watcher (Synta) HEQ5 SynScan: go-to, max. load 30 pounds. Takahashi EM-200: manual or go-to, max. load 35 pounds. Takahashi EM-200 Temma 2Z: go-to, max. load 35 pounds. Vixen GPD2: manual or go-to, max. load 35 pounds. Vixen Sphinx (SXW): go-to, max. load 35 pounds. Astro-Physics Mach1GTO: go-to, max. load approx. 45 pounds. Celestron CGEM: go-to, max. load 40 pounds. Celestron CGEM II: go-to, max. load 40 pounds. OptiCraft Model 1: manual, max. load 40 pounds. Orion Atlas: go-to, max. load 40 pounds. Skywatcher (Synta) EQ6: manual or go-to, max. load 40 pounds. Skywatcher (Synta) EQ6 SynScan: go-to, max. load 40 pounds. Celestron CGX: go-to, max. load 55 pounds. Losmandy GM811G: go-to, max. load 50 pounds. OptiCraft Model 2: manual, max. load 52 pounds. Vixen Sphinx SXD: go-to, max. load 50 pounds. Vixen Sphinx SXP: go-to, max. load 50 pounds. Celestron CGE: go-to, max. load 65 pounds. Losmandy G11: manual or go-to, max. load 60 pounds. OptiCraft Model 3: manual, max. load 60 pounds. Vixen AXD: go-to, max. load 66 pounds. Astro-Physics 900GTO: go-to, max. load approx. 75 pounds. Celestron CGX-L: go-to, max. load 75 pounds. Losmandy G11GT: go-to, max. load 75 pounds. Parks Superior: manual, max. load approx. 80 pounds. Vixen Atlux: go-to, max. load up to 75 pounds. Celestron CGE Pro: go-to, max. load 90 pounds. Meade LXD 750: go-to, est. max. load 85 pounds. OptiCraft Model 4: manual, max. load 95 pounds. Takahashi EM-400: manual, max. load 85 pounds. Losmandy HGM Titan: manual or go-to, max. load 100 pounds. Paramount MYT: go-to, max. load. 100 pounds. Skywatcher (Synta) EQ8 SynScan: go-to, max. load 110 pounds. Takahashi EM-500: manual or go-to, max. load 89-120 pounds. Vixen Gaiax: go-to, max. load 100 pounds. Astro-Physics 1200GTO: go-to, max. load approx. 140 pounds. Mathis Instruments MI-500: go-to, max load 180 pounds. Paramount ME: go-to, max. load. 150 pounds. Paramount MX+: go-to, max. load. 180 pounds. OptiCraft Model 5: manual, max. load 162 pounds. Astro-Physics 3600GTO "el Capitan": go-to, max. load approx. 300 pounds. Mathis Instruments MI-750: go-to, max load 300 pounds. Meade Max Mount: go-to, max. load 250 pounds. OptiCraft Model 6: manual, max. load 210 pounds. OptiCraft Model 7: manual, max. load 280 pounds. Parks Observatory Mount: manual, max. load approx. 260 pounds. Mathis Instruments MI-1000: go-to, max load 480 pounds. Takahashi EM-3500: manual or go-to, max. load 350 pounds. Copyright 2009, 2017 by chuckhawks.com. All rights reserved.